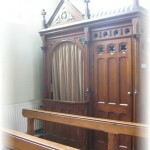 Preparing for Our First Confession. 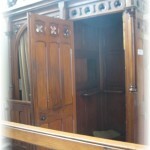 we took a look at the confession boxes in our church. 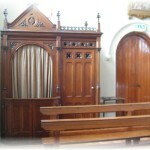 would have been to confession in the confession box. We saw where the priest would sit. 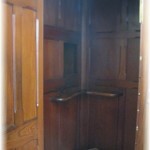 Then we went back in time and went into the confession box. We liked it. It was quiet and peaceful in there. on the arm rest in the box at his First Confession. at about one height with my head. We thought that was a funny thing to do! This entry was posted in Children's Work, Communion Preparation, Religion and tagged Children's Work, Communion Preparation, Religion. Bookmark the permalink. Congratulations to all in Room Six on making your First Confession, and thank you Ms Beausang for all you did. It was a lovely ceremony and all that work paid off – everybody did their part beautifully, and we were all very proud. And… Good luck tomorrow. We have our fingers crossed. I was very proud of all the boys and girls in Room Six on Saturday. You are right, they all played their parts very well. I’m just sorry, I can’t bring the whole class.